Simple sassy dress! This sensational sweetheart short prom dress has a glamorous celebrity style with beautiful pleats on the close-fitting bodice and the empire waistline. 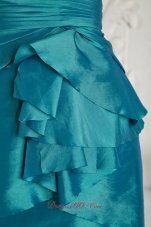 The short skirt accented with tiers of ruffles in irregular length is of charm and fascination. Zipper up closure finishes the dazzaling look. You will not miss it! Ladies let me tell you the dress is MAGNIFICENT, the quality excellent ! My daughter missed measured herself and the seamstress realised the error contacted us and we were able to remeasure her and send of the right measurement so the dress was perfect. Could not be happier with our experience. hi, I ordered this dress for my mom, it is beautiful although I don\'t know if the size is right and will fit her...she is sick today and she won’t try it on....maybe tomorrow....I\'ll let you know as soon as I see her with the dress on! Anyway the tissue and the shape is truly pretty!